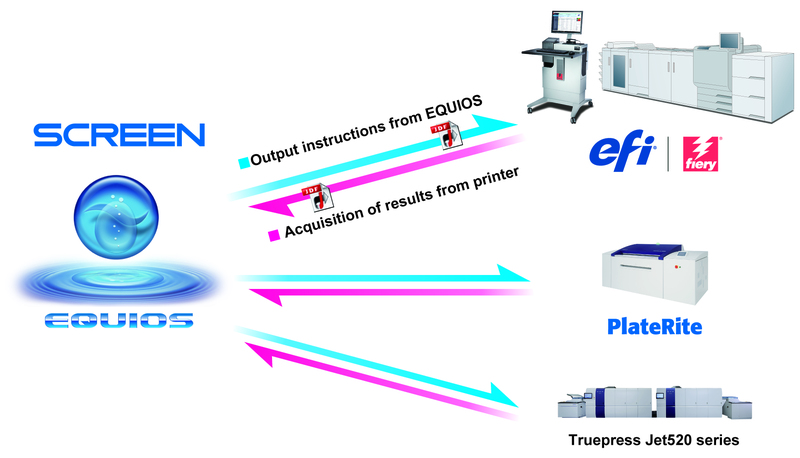 SCREEN Graphic Solutions Co., Ltd. (SCREEN GA) and Electronics For Imaging, Inc. (Nasdaq: EFII) today announced a partnership to establish bi-directional connectivity between SCREEN’s EQUIOS® universal workflow and EFITM Fiery® digital front ends (DFEs). The centralized workflow provides superior efficiency and labor savings through automation for today’s printing business. The printing industry today is facing more and more demands for short runs with fast turnarounds, with value-added services such as personalization. The trend is creating the continuous need to improve efficiency and productivity through workflow automation and digital printing. For example, while service providers can print many transactional/direct mail jobs with SCREEN’s Truepress® Jet 520 series, that often requires short-run reprints. It can be more cost efficient to delegate these short-run jobs to lighter production devices such as Fiery DrivenTM cutsheet printers. Or, in commercial printing environments, it is becoming very common to have a hybrid setup where long-run jobs are handled by traditional offset presses, with mid- or short-run jobs, or jobs that require personalization, handled by digital presses. In these scenarios, the effective hybrid setup requires seamless routing between multiple presses and centralized control with clear visualization of each machine and job status in order to determine the most efficient production schedule and process. “SCREEN’s EQUIOS platform integrated with EFI Fiery DFEs and Fiery Driven digital presses make it easy and quick to direct jobs to the appropriate systems with universal job tickets and print-ready files. The connectivity also provides EQUIOS users access to one of the widest selections of production printers from industry leading vendors that fits today’s most demanding scenarios,” said John Henze, vice president, Fiery marketing, EFI. SCREEN’s EQUIOS universal workflow combines its prepress workflow, which has been cultivated over many years, and the state-of-the-art inkjet technology supported by many of print service providers today. Featuring various print workflow automations and easy-to-use intuitive user interfaces, EQUIOS can control the entire print manufacturing process from workflow rule design, layout editing, and production progress monitoring to quality management. EFI’s Fiery DFEs keep driving innovative growth in the digital printing industry, offering the industry-leading RIP with superior processing speed and reliable, precise output quality. Over the last 25 years, Fiery DFEs have earned high trust and been recognized as a de facto standard for digital production printing by many print-on-demand device vendors and service providers, with over 1.9 million shipments to date. ・The EFI logo and Fiery are registered trademarks of Electronics For Imaging, Inc. in the U.S. and/or certain other countries. Fiery Driven is the trademark of Electronics For Imaging, Inc. in the U.S. and/or certain other countries. ・EQUIOS and Truepress are registered trademarks and/or trademarks of SCREEN Holdings Co., Ltd.